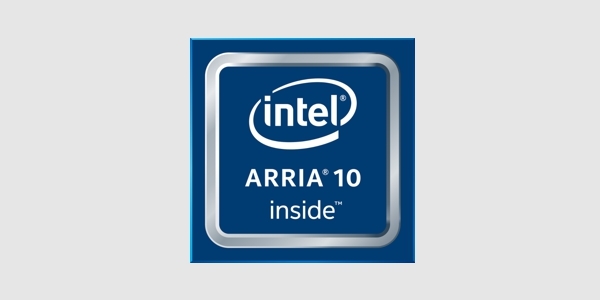 Intel Arria 10 deliver more faster core performance and up to a 20% fMAX advantage :: Zerif Technologies Ltd.
Intel® Arria® 10 FPGAs deliver more than a speed grade faster core performance and up to a 20% fMAX advantage compared to some, using publicly-available OpenCore designs. Intel® Arria® 10 FPGAs and SoCs are up to 40 percent lower power than previous generation FPGAs and SoCs and feature the industry’s only hard floating-point digital signal processing (DSP) blocks with speeds up to 1.5 tera floating-point operations per second (TFLOPS). The BittWare 510T Compute Acceleration Card is an FPGA co-processor that delivers maximum performance-per-watt for intensive compute applications such as the datacenter. In a GPU format, and with a 16-lane PCIe Gen 3 card, it is powered by dual Altera Arria 10 floating point FPGAs. The BittWare 385-SoC is an ARM-based System-on-Chip FPGA accelerator board built on the Altera Arria 10 SX F34. It features dual QSFP ports, two banks of 4G DDR4 SDRAM external memory, and 8-Lane PCI-Express Gen 3 in a NIC form factor. BittWare’s 385A-SFP is an Intel Arria 10 based FPGA network accelerator card for 8 lane, single width, PCI Express Gen 3, with six SFP+ ports, rated at 10 Gbps. The BittWare 385A is a low profile 1.5 Teraflops FPGA accelerator board built on the Altera Arria 10 1150 GX. It features dual QSFP ports, 8GB DDR3 SDRAM external memory, and 8-Lane PCI-Express Gen 3. The BittWare 385C is a low profile FPGA computing and I/O platform achieving 1.5 Tflops peak. This Accelerator Card features 8-lane PCI-Express (PCIe Gen3 x8), dual QSFP28 100 GbE, and 8 GB DDR3 on-card memory. The BittWare A10SA4 PCIe accelerator board built with a Altera Arria 10 GX 1150 FPGA is well suited to large FPGA loads in the data center. The A10SA4 supports the Open Computing Language (OpenCL™) programming model, which enables a high-level software-like development flow, which greatly simplifies FPGA development. BittWare’s A10PL4 is a low-profile PCIe x8 card based on the Altera Arria 10 GX FPGA. The Arria 10 features high density and a power-efficient FPGA fabric. Included are high-speed transceivers, hard floating-point DSP blocks, and embedded PCIe x8 Gen3. BittWare’s A10P3S is a 3/4-length PCIe x8 card based on the Altera Arria 10 GX/SX FPGA and SoC. The Arria 10 boasts high densities and a power-efficient FPGA fabric married with a rich feature set including high-speed transceivers up to 28 Gbps, hard floating-point DSP blocks, and embedded Gen3 PCIe x8. BittWare’s A10PED is a full-length PCIe x8 card featuring two Intel Arria 10 GX FPGAs. The Arria 10 boasts high densities and a power-efficient FPGA fabric married with a rich feature set including high-speed transceivers up to 15 Gbps, hard floating-point DSP blocks, and embedded Gen3 PCIe x8.